post and have not yet updated your PS3, make sure you keep it that way. 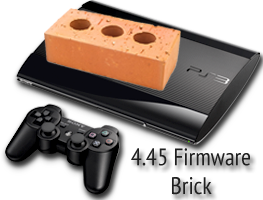 By updating your PS3 to the latest firmware you risk having your console bricked, i.e. made unusable (other than being paperweight of course). It seems this issue is affecting consoles with upgraded HDD and not stock PS3 consoles, however, just to be on the safe side it is advised you do not update it. Luckily, there's an easy way to fix your console or unbrick it. It involves a series of steps, but should not take a long time. You do not need to open your console up or go into any technical details. The PS3 system will now boot to recovery mode. Attach the USB cable to your console and controller and press the PS Button. Warning: Do not play around with the options on this menu. Doing so may result in your HDD being formatted. Your HDD carries trophies, saves, videos, pictures, music, games, and other important data. My PS3 can't find the file. All cases match.